Early selection of classic French melon bred to actually ripen here in the north! 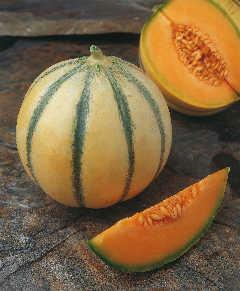 Charentais are a type of European cantaloupe, meaning a small, fragrant, very sweet melon having a tannish-grey skin with dark green stripes. Originated in the Charentes region around 1920. They generally do NOT have the bumpy netting that we expect on our muskmelons around here. Alvaro is a modern selection which is resistant to splitting, even in wet years. They weigh in at a tidy 2 lb, so slightly larger than a softball.